Food - Cumbria - Most people put those two words together and come up with either Cumberland Sausage or Kendal Mint Cake. No-one is quite sure why the Cumberland Sausage is a coil rather than links. But it is thought that this distinctive sausage may have been made thicker than normal sausages to suit the taste of German miners who were in Cumbria during the reign of Elizabeth I. Whitehaven was one of England's major ports during this time and the sausages being spiced may have been influenced by the availability of exotic spices into Cumberland. So this is what you get if you take your eye of the cooking pot! It is thought that Joseph Wiper invented Mint Cake entirely by accident. He was actually trying to make a clear glacier mint, but took his eye off the pot and ended up with a cloudy mint of a different consistency. There are three main brands still in production in Kendal today. My own weakness is for Romneys brown mint cake. Whether you prefer white, brown or chocolate coated, the high glucose content make this a great energy boost on a rainy day walking up one of the many local fells. 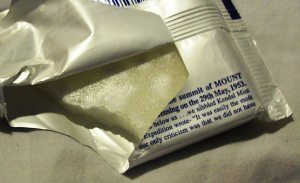 Indeed the famous Kendal Mint cake was taken on the 1953 Everest expedition and eaten on the summit by Sir Edmund Hilary and Sirdar Tensing. If you are going to be visiting southern Cumbria during April then try to take a detour through the Lyth Valley. The white blossom on the damson trees is absolutely spectacular. Damsons have been part of the history of the Lyth Valley for centuries. They have had many uses including using their skins to dye textiles. These days usage is mainly restricted to jams, puddings and of course my personal winter favourite Damson Gin. Most local pubs stock damson gin if you want to try a glass. Lyth Valley Damson Day is a family day and takes place during April. Read more about the 2011 Damson Day. Who would have thought that the Post Office in Cartmel would bring such fame to the Sticky Toffee Pudding? Although both Cartmel and Sharrow Bay in Ullswater both lay claim to having invented this wonderfully moreish desert, there is no doubt that it is now a national favourite. The Cartmel pudding is made form the finest natural ingredients and although this quaint priory village is well worth visiting. Shop hours: Monday - Saturday: 9.00 - 5.00 Sunday: 10.30 - 4.30. Don't despair if you can't get to Cartmel..this pudding is so good that many farm shops and quality stores are now stocking it too! Grasmere Gingerbread is unique. I don't think that I have ever tasted anything else remotely similar. I have to admit I do have a real weakness for it. It is still made to the same secret Sarah Nelson recipe and available from Sarah Nelson's original cottage tucked away by St. Oswald's church in Grasmere. 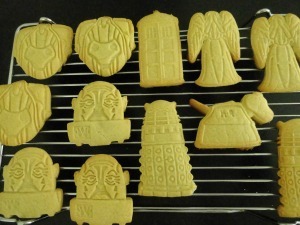 Lakeland Dr Who Cutters to the rescue! Wedding, Birthday or Celebration in Cumbria? Christine at Cake Events is a Cupcake entrepreneur with breathtaking designs that will leave you spoilt for choice! She is based in the small Cumbrian town of Barrow-in-Furness. You can see more of her magnificent creations here. Farm shops in Cumbria are a great way to buy local, good quality produce. Why not learn how to smoke that next batch of fish that you catch? If you like the idea of being in control of what happens to your food before it hits your table then don't miss these great venues in Cumbria where you can learn how to smoke food. Whenever we find a really great little cafe that offers you something out of the ordinary, we will post it here.